It’s natural to want to protect young children from hearing about, or seeing the ‘bad stuff’ that goes on in the world – and can sometimes even occur within our own families. But it’s not always possible to avoid children’s questions about unpleasant issues – be that death and destruction in the news, or arguments, illness or death within the family. And while it can be tempting to try to gloss over the issue – especially if the child is very young – Dr Shauna Tominey, author of new book Creating Compassionate Kids: Essential Conversations To Have With Young Children, says tackling the tough stuff is often good for the parent-child relationship. “As parents of young children, we can often find ourselves caught off guard by children’s question. Children sometimes bring up tough topics before we feel ready to address them – but tackling these tough conversations gives us a chance to let children know that it’s OK for them to come to us about anything,” she says. Tominey, an assistant professor of practice and parenting education specialist at Oregon State University in the US, notes that as they get older, children will seek information from friends, other adults or the internet – and while it’s normal for them to grow increasingly independent, it’s also important they know they can turn to their parents at any time. Reassure children they’re safe, or that you’ll always do your best to keep them safe. Help children regain a sense of control by talking about things they can think, say and do to manage feelings now and to help others who might be worried or afraid too. How we talk about a topic shapes how children feel about it, explains Tominey. “Children don’t always have the stigmas that we do about topics like race, gender or mental health, and we can help them have open conversations if we stretch ourselves to do the same.” Set a tone that fosters children’s natural curiosity, and help them feel comfortable speaking openly without fear of punishment or shame. Hearing what your child knows about a topic can help you decide where it might be best to start. 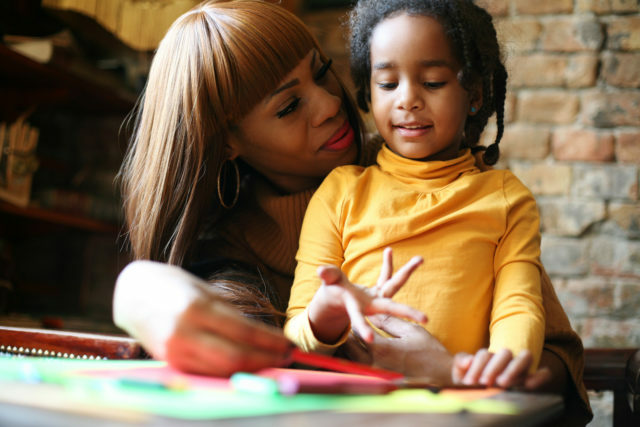 Understanding what your child’s thinking about, and what questions they have, can help you ease fears and clear up misunderstandings. Let your child know all feelings are OK and that you have feelings too. Set an example by sharing your feelings with your child and encourage them to share their feelings when they’re ready. You and your child probably have many different feelings about a topic, and they may not be the same as one another’s. Talk about what you can do to express those feelings in a helpful way. Comfort your child during emotional moments, but come back to the topic at a time when you’re both calm. “When you or your child feel triggered – stressed, angry, or frustrated – it can be challenging to think clearly, speak calmly, and make good choices,” says Tominey. Think about the information and skills your child needs to cope with a situation or make good choices if a challenging issue arises in the future. Encourage them to think about what they can do, who they can talk to, and things that happen that might make it hard to make good decisions. Conversations with children happen in many different ways, including while running errands, during bath time, over family meals, in the car, and more. Sometimes it’s easier to talk about a challenging topic while doing another activity together. Children learn through repetition. Having conversations more than once will help them learn different sides of a topic. In addition, what children are able to remember and understand will change over time. There may be times when a conversation doesn’t happen the way you’d like it to. Step back, reflect on how you can approach the topic differently next time, and give yourself the chance to try again. Creating Compassionate Kids: Essential Conversations To Have With Young Children by Shauna Tominey is published by WW Norton, priced £16.99. Available now.